Actually a member of that strange subset of devices that's designed more for viewing (and printing, thanks to direct printer hookup support) digital photos than anything else, the Vosonic as a result doesn't stand quite shoulder to shoulder with other video players. 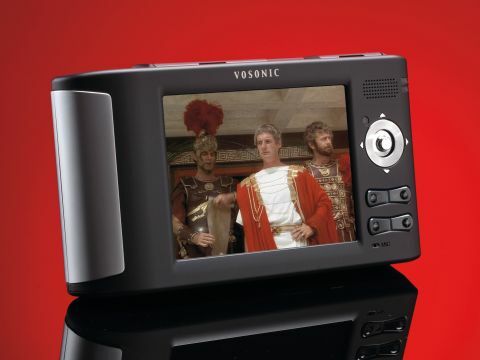 It touts video playback as one of its main features and, true, it supports DVD-resolution DIVX and XVID (WMV is supported, but to a maximum of only 352 x 240), but it doesn't quite have enough poke. Framerate for the highest-res videos is sliced in half, which means that most video is jerky, almost to the point where it's unwatchable. It's a shame because it manages a bright, clear picture otherwise. The screen itself is only 320 x 240 and not widescreen, so that's an immediate on-paper turn-off for some customers, but in terms of actual image quality the Vosonic overcomes this hurdle impressively. It also throws in a docking station that supports video/audio in and out. If only it played video smoothly. One thing it's really got going for it is a built-in memory card reader/writer, supporting most of the major card formats. This is a gift both for copying stuff off a digital camera's card while on the move if you need to clear space for more photos, and for ad-hoc expansion of the device. With cheap 2 and 4Gb memory cards available you can easily add an extra 10 or 20 per cent capacity to the Vosonic. Better yet, it also actively supports having its own hard drive replaced with a larger one if you like. It's possible to do this on a number of other players, but they'll try hard to stop you. Because it uses a standard laptop drive, it's significantly bigger than most rivals, but this does make finding a bigger HDD cheaper and easier than it would be with one of the more microscopic drive types. Its interface is on the crude side, but it's pretty intuitive. The 256-colour icons are an odd choice given that it's capable of several-thousand-colour video, though. Uploads are drag and drop, which is easy enough. You won't be using it as any kind of serious music player though, because tracks can only be browsed by filename and folder, and not by metadata such as album and artist, with playback simply by alphabetical order. A shame that the work spent on making the unnecessary colourful visualisations displayed as songs play wasn't put into more organisation options instead. It's also a sluggish performer, taking just under 20 seconds to buffer a full-length movie before it began playing. So, while it's useful as a storage device with a few party tricks, it's not really a viable alternative to more pedigreed video players. The expansion options are good and hey, it's got Tetris (sorry, Matrix), but when it comes to playing stuff it misses with almost every one of its punches. It's not a bad piece of hardware, so a firmware update could one day rescue it, but right now you're better off looking elsewhere.